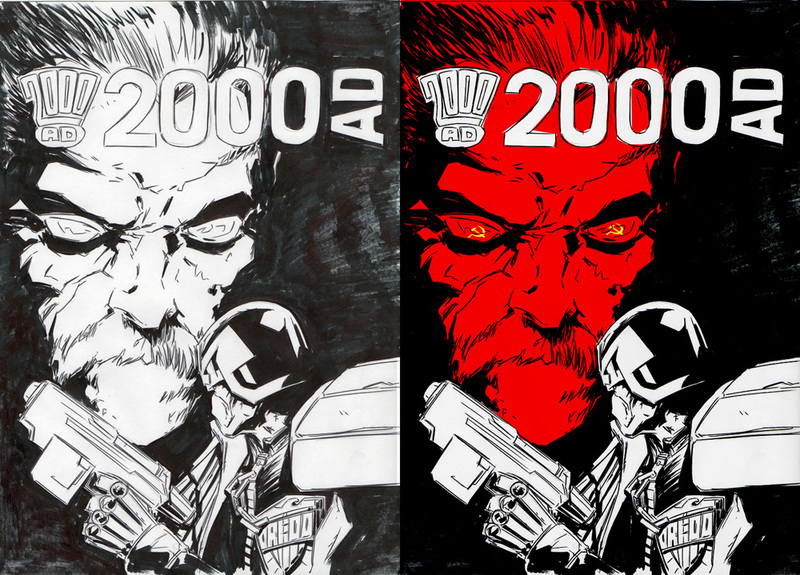 2000AD Covers Uncovered: Ben Willsher - Gas Attack! Ben Willsher - Gas Attack! Cough! Splutter! Here's a cover I've been gagging(!) to see since Ben Willsher's excellent podcast interview with deviant Rich McAuliffe on theallway excellent (except when I'm on it) Everything Comes Back to 2000AD podcast. "The original concept for the cover was simply to feature Borisenko , the Sov terrorist cell leader. 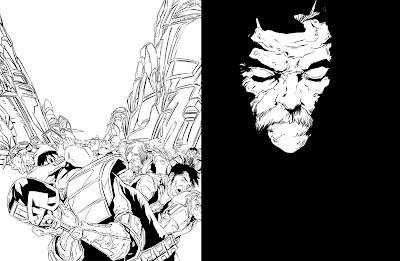 I initially thought it would be nice to try a more stylistic minimal image of the ‘presence’ of Borisenko looming over Dredd. I wanted Borisenko’s face to capture the spirit of the traditional image of soviet Russia and the Sov-Block of 2104, and drown his face in a pool Bright red-As a rather throw away idea, I added the Hammer and Sickle motif into his blank eyes." I have to say, I REALLY love this image, it's terrifying! 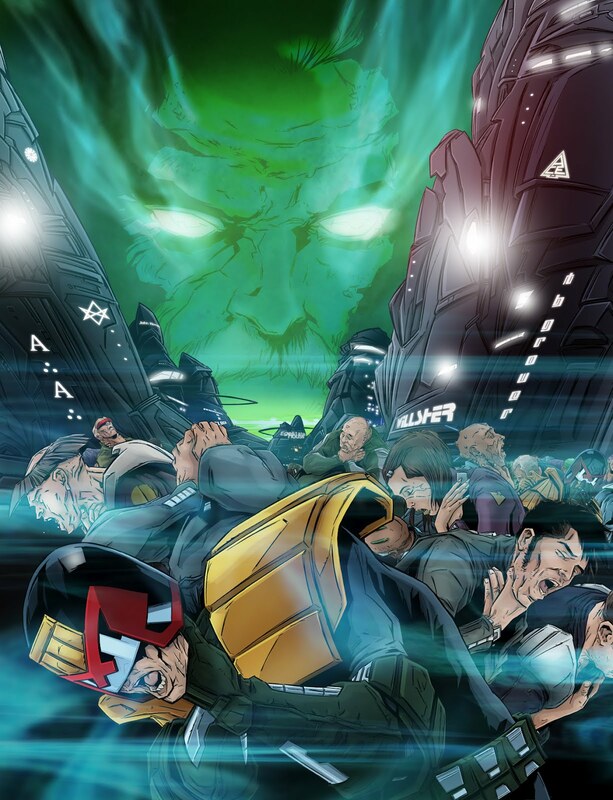 Ben continues "Tharg liked the image of Borisenko menacingly hanging over the image, but thought it might be better to drop Dredd, and replace it with “lots of MC-1 citizens clutching their throats and dying” from the gas attack. This gave me a chance to increase the threat of Borisenko and his agents, by having him looming over the entire city, instead of just Dredd; and emphasize that they could be anywhere in the vast metropolis!" Creepy! "I offered 2 potential colour choices: One with the Red face again (I opted to drop the H&S motif this time, as thought it was too much) and one with a more gaseous form to Borisenko’s face." 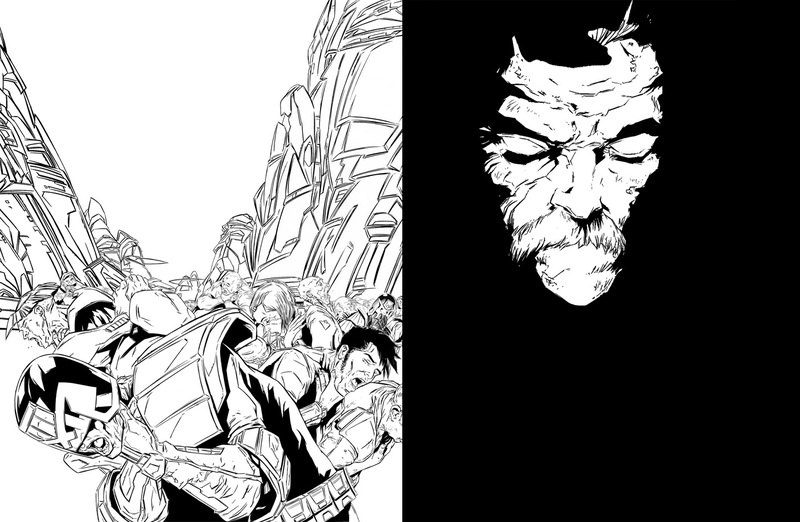 "Tharg preferred the “half strength” gaseous version, so I started to draw the image up ready to be coloured. As I started, I realised that despite the fact Dredd had been dropped from the image, it would still benefit from having some judicial presence. So I replaced the generic Citizen at the front, with a gasping Judge. No sooner had I done this, than my ‘Fan alarm’ went off inside my head, telling me other fans may pick up on the fact that he hasn’t used his respirator! So I quickly added another Judge in the background with their respirator pulled down (obviously, they had more chance to react or have faster responses than the poor judge in the foreground-haha)." 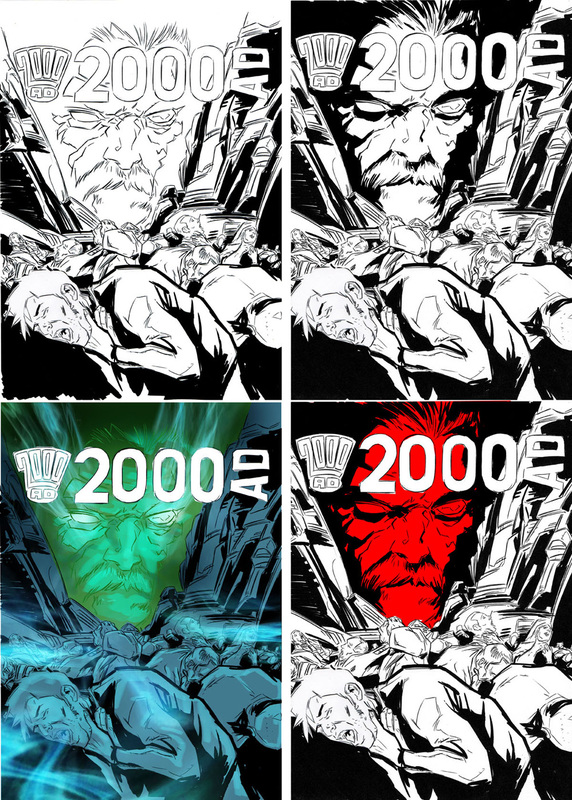 "The next stage was colouring the image. I chose not to bring out the face in the Background in quite the same manner as I had in the colour rough (see image 2), as this looked too ghost like, and I really wanted to get across that it was a sense of foreboding as background to the attack, rather than a spectral attack." "I did play around with several colour variations, to test the strength and tone of the gas. We got it down to three options, but stuck with the original colour choice (Image 5) as our final version." 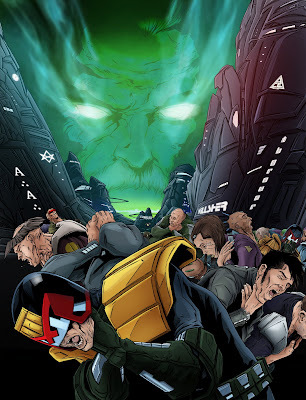 Wow, an excellent cover and a brilliant commentary from one of my favourite Dredd artists. Thanks to Ben for sending the fantastic images (I still firgging LOVE image 1!) I can't wait to see him back in the prog. Check out Ben's cool website here. i haven't read this weeks Dredd yet, which could answer my question, but i'm intrigued by the significance of the curious occult secret society symbols on the city blocks - is there something the Willsher droid is trying to tell us? should i alert the Illuminati?! Jon Davis-Hunt - Rrrrrrraaaaar-paround Cover! Covers Special - Who's the McMahon? Leigh Gallagher - Chute to Kill! Carlos Ezquerra - Alpha! Carlos Rules Okay!